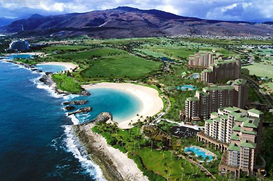 Ko’Olina Resort & Marina is a thriving 642 acre beachfront resort and residential community located on the Western shores of Oahu approximately 17 miles for the hustle and bustle of Honolulu. Ko’Olina offers several amenities including a championship golf course, a full-service marina and sparkling ocean lagoons ringed by pathways for strolling, running and biking. The 170 acre, par-72 golf course, complete with water features on many holes and multi-tiered greens, originally opened in January of 1990, has hosted many high profile golfing events such as the LPGA Tour’s Hawaiian Ladies Open, the Senior’s PGA Tour’s Ko’Olina Senior Invitational, and the Field’s Open in Hawaii from 2006 to 2008. Several luxurious hotels including, Aulani, A Disney Resort & Spa that recently, in the fall of 2011, joined the JW Marriott Ihilani Resort and Spa, Ko’Olina Beach Villas Resort, Marriott’s Ko’Olina Beach Club, populate the resort along with oceanfront wedding chapels, a popular luau show and more. Several residential communities also offer a compelling range of options for couples and families, from fairway townhomes and plantation-style cottages to luxury condominiums and single family homes, golf estates, beachfront villas and vacation ownership units. Known as Honolulu’s premier resort destination, Ko’Olina combines the seclusion and prestige of a resort community with the proximity to Hawaii’s business and cultural center.